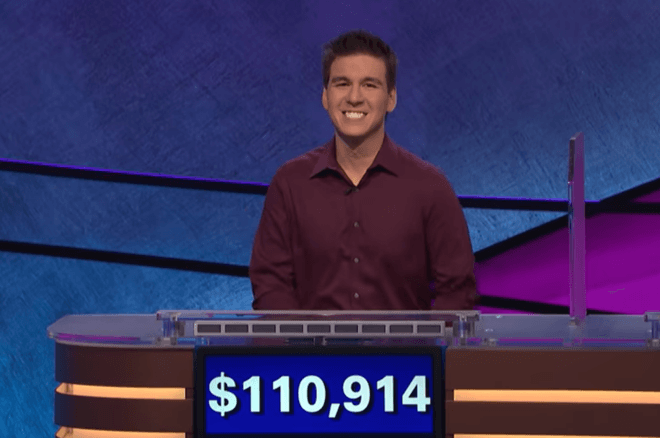 James Holzhauer is using some aggressive gambling strategies in his historic run on Jeopardy! "I think it was a huge advantage that I don’t blink at gambling large amounts of money when I think I have a big edge." While a wide knowledge base on a range of topics is probably the most important trait for any Jeopardy! contestant to possess, as it turns out, experience in gambling can also be quite useful. Just ask 34-year-old Las Vegas based professional sports bettor James Holzhauer, who is on a historic run on the popular American game show. On Tuesday, he broke the single-day record for most money won on the show, showing an aggressive and fearless style characteristic of a professional gambler. "I think it was a huge advantage that I don't blink at gambling large amounts of money when I think I have a big edge." Wager big he does. On his way to breaking the record, Holzhauer got a "Daily Double" holding an already big lead with $14,600 and he used his hands to perform an all-in shoving motion as you'd do with a stack of chips in front of you. Host Alex Trebek understood that it meant "all of it." The answer for that one was, "In 1904, Oklahoma City policeman Joe Burnett killed Ed O'Kelley, who had killed Robert Ford, who had killed this outlaw." "Who is Jesse James?" said Holzhauer. Yes it was. Suddenly he was up to $46,800 and soon got another Daily Double. He toned down his bet the second time, but his sizing was clearly strategic: $25,000. He got that one right, too. In "Final Jeopardy," Holzhauer sat with $72,600 — just $4,400 away from Roger Craig's record as Trebek pointed out — while his next competitor had $7,000 total. He could have wagered up to $58,599 and still been guaranteed to win, but he risked $38,314. That bet was strategic as well, but in a different way. When he got the question right in the Physics Terms category — "What is quantum leap?" — his total matched his daughter's birthday (11/09/14) and he included a message for her: "Happy Birthday Booger." About that, he told The Post, "Since I could have bet more on Final Jeopardy, it'll end up being the most expensive birthday gift I ever get my daughter." He's also worked in other family member birthdays and messages to family, and when he wagers $9,812, he's saying happy anniversary to his wife. His astonishing run netted him $110,914 on the day and Trebek asked rhetorically, "Is it too soon to start thinking about Ken Jennings comparisons?" Holzhauer, a native of Naperville, Illinois and a 2005 graduate of the University of Illinois, majored in math, and he also grew up watching sports and Jeopardy! — a combination of interests that paved the way for his unconventional profession of sports betting. "When I came home from school in Naperville, there were two options for afternoon TV viewing: Cubs games and 'Jeopardy!' Thus I got hooked on sports statistics and game shows," he told the Las Vegas Review-Journal. "I told my dad that I wanted to invest in a stock market for sports teams when I grew up and promised my beloved granny that I would appear on 'Jeopardy!' one day." He also prepared by reading children's books, which are packed with easily digestible information and pictures. Still, his biggest preparation has been his career. "I promised my beloved granny that I would appear on 'Jeopardy!' one day." Holzhauer in fact ran a poker strategy site to build his bankroll before embarking on his career in sports gambling, ESPN reported. Once he made that move he started out with baseball futures before shifting his focus to football, basketball and hockey. "I'm proud that I've found success in many different fields of sports betting, but the most important thing about my work is the freedom it gives me to travel and spend time with my family, which I would never have [with] a nine-to-five [job] — although maybe not on a college football Saturday." Holzhauer's unconventional and aggressive approach to the game surely seem to be giving him an edge over his competition, which have included professionals in an array of fields including a veterinarian, a computer programmer, a lawyer, a medical student, an accounting professor, and a journalist to name a few. "I know that one bad bounce is all it takes to lose a great bet." But he's not the first gambler to succeed on the show. Back in April 2015, former professional poker player Alex Jacob won five games for more than $150,000 and went on to win the Tournament of Champions for another $250,000 in what Trebek said was "the most dominant performance by anyone in any of our tournaments." Jacob told Variety: "The thing that makes 'Jeopardy' different than poker... is that there's always another poker tournament, but you only get one Tournament of Champions." Another contestant who made use of similar strategies was Arthur Chu, who earned $298,200 over 11 wins and finished runner-up in the TOC for another $100,000 in early 2014. Like Jacob and Holzhauer, Chu wasn't afraid to go all in on "Daily Doubles," a low risk–high reward move to try to build a big stack since he had a good edge as far as likelihood of answering the question correctly, especially given the extra time to answer. Chu also made use of the Forrest Bounce strategy, hopping around the board in a non-linear way to catch his challenger off-guard and delay their reaction times. He even used Game Theory in his unorthodox "Final Jeopardy" wagering strategies to give himself the best chance of winning outright, even when it meant increasing the chance of a tie resulting. Stay tuned to Holzhauer's run to check out his strategies in action. Five out of six on "Final Jeopardy"
While he hopes to continue his hot run, Holzhauer knows better than anyone about the realities of variance. "I feel that I prepared for 'Jeopardy!' as well as I could have, but I also know that one bad bounce is all it takes to lose a great bet," he told US Bets. Spoken like a true advantage gambler. Watch Holzhauer attempt to keep the dream alive by checking your local listings for Jeopardy! You can also track his daily progress here, but fair warning, spoilers are posted on the morning of each show run.